The counter flow design (CCT-B Series) is compact, its bottle shape circular design requires less space than that of the cross flow design (CCT-R Series) when installed. The full 360 degree air inlet allows flexible placement. Our towers are factory-fabricated, field-erected, FRP (fiber-reinforced-polyester) constructed, PVC film-filled, induced -draft counter flow type, industrial duty, and non-corroding towers. Due to lightweight these can be installed on rooftops. F R P construction is not effected by rain hail or sun shine. CCT-B Series is available in a wide range of models. 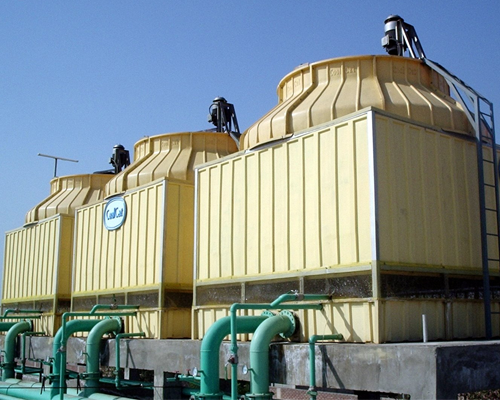 Using the cross flow principle, warm water flowing down through a cooling unit is cooled by air drawn upwards by a fan. Evaporation and direct heat exchange cause a rapid drop in temperature. 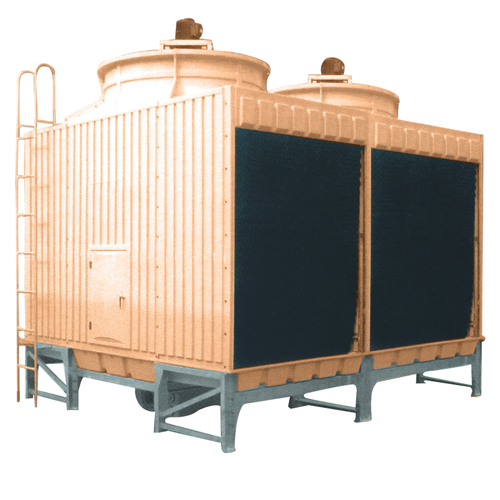 Compared to counter flow cooling towers, induced-draught cross flow cooling towers are much quieter and smaller. The performance figures are next to perfect. High efficient PVC fills with large surface area with negligible resistance to airflow. Space Saving & Light in weight. Self Revolving Stainless Steel Sprinkler with Low Head Loss. Maintenance down time is very low. Energy saving & low noise level. Easy access through casing and basin simplifies cleaning individual fiberglass panels are bolted together for periodic wash down and general cleaning. 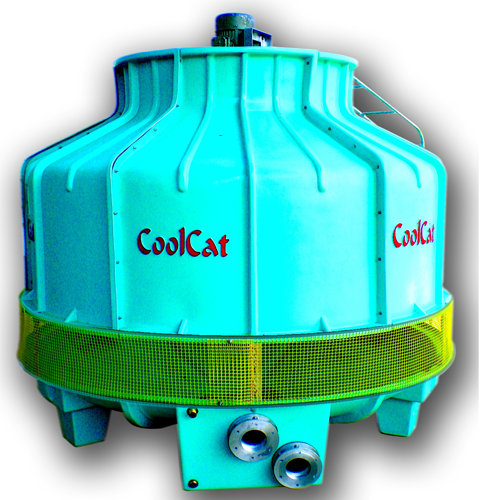 The CoolCat Cooling Tower is designed for durability and long life even under the most severe environmental weather conditions. The efficiently designed ultra-violet raysresistant PVC Honeycomb filler with thermal forming corrugation creates a surface area that allows for maximum dispersion of water which creates a superior cooling effect. Very efficient self-revolving sprinklers made of Stainless Steel are used. Completely corrosion resistance and low head loss sprinklers are installed for perfect water spray with very little head pressure. Tower body is made out of PVC / FRP, which is free from corrosion, so it is very durable. The tower body is also resistant to the hurt from sunlight. The specially designed PVC drift eliminator can produce excellent efficiency at stopping spray, so the carry over volume can always be kept within 0.005%, and only a slight pressure drop loss will be caused there. Fiberglass casing and all steel components are hot dipped galvanized /stainless steel give good corrosion resistance. 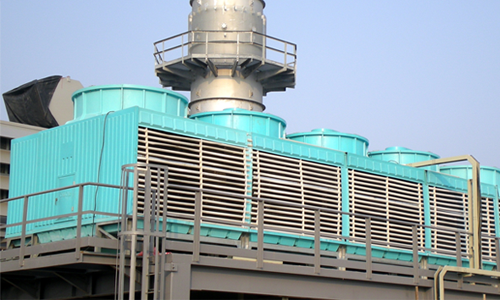 The axial flow direct driven fans have been specifically designed for cooling tower use. It is made of cast alluminium blades and hub. They provide a large volume of stable air at low pressure while maintaining desired low noise levels. Special totally enclosed flange mounted motors, with extended shaft and sealed top is supplied with cooling tower. The motor is having totally weather proof IP-55 degree of protection, suitable for hot and humid atmosphere and it is covered by FRP motor cover. All supporting structure are of hot Dip Galvanised or Stainless Steel. Copy Right 2014 : Acro International - All Rights are Reserved.